I was so excited to get to Bolivia, as it was a country I had always dreamed of visiting since I was a kid. It has such a diverse array of landscapes, lush mountain ranges through the Andes, barren windswept deserts and of course the famous Uyuni Salt Flats. I would also meet up with another adventure rider Chris, whom I met on the Stahlratte crossing the Darien Gap. The three major features of this part of my adventure were Lap Paz the capital which is situated inside a canyon that is both grand and intimidating. I would also travel the Death Road or locally known as North Yungas Road, historically one of the most dangerous roads in the world. Finally the last major part of this country I would experience was the Uyuni Salt Flats and incredible landscape that I will not forget anytime soon. Onwards to Chile! I will miss Bolivia, the country provided me with some of the biggest highlights of my trip. I will not miss the gas station scamming that goes on in this country though. Ever since I started planning this trip, Salar De Uyuni was one of the places I dreamed of going to. If any of you are doing the same, I am sure it is one of the places on your must see list. After a rather average night staying at the Hotel Palacio de Sal, a 4-star hotel with one star Internet and 0-star management service, Chris and I met up to do the Salar De Uyuni Salt Flats. Finally, on my way to Salar de Uyuni, Bolivia (The Famous Salt Flats) with Chris was always going to fun. Chris was riding his KLR – one which would increasingly cause him issues further down the road to Patagonia. Getting to Death Road, Bolivia (North Yungas Road) was always going to be a challenge. However, after meeting with Motorcycle Tours Bolivia and hiring a private guide (Tito) to take us there, we knew we would be in good hands. 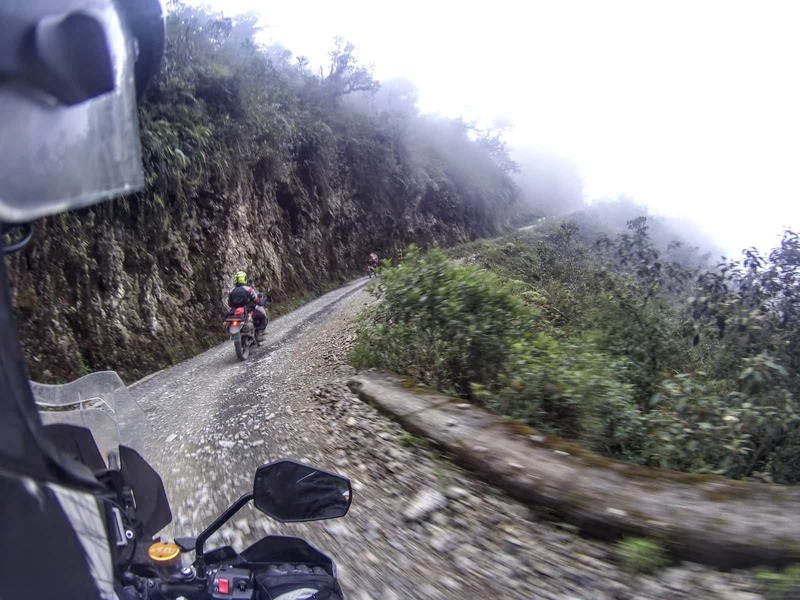 I was joined by Chris Moody, another experienced rider I met on the Stahlratte and who joined me in La Paz for the Death Road or as it is known locally as North Yungas Road. After nearly 3 weeks in Peru, it was time to go from my last stop in Puno and across the border by motorbike into La Paz, Bolivia. The trip would take me following across mostly on paved roads and swept along high altitude valleys for most of the way through a variety of weather conditions. Thankfully there was little to no traffic on this road as it is the northernmost border town from Peru to Bolivia.